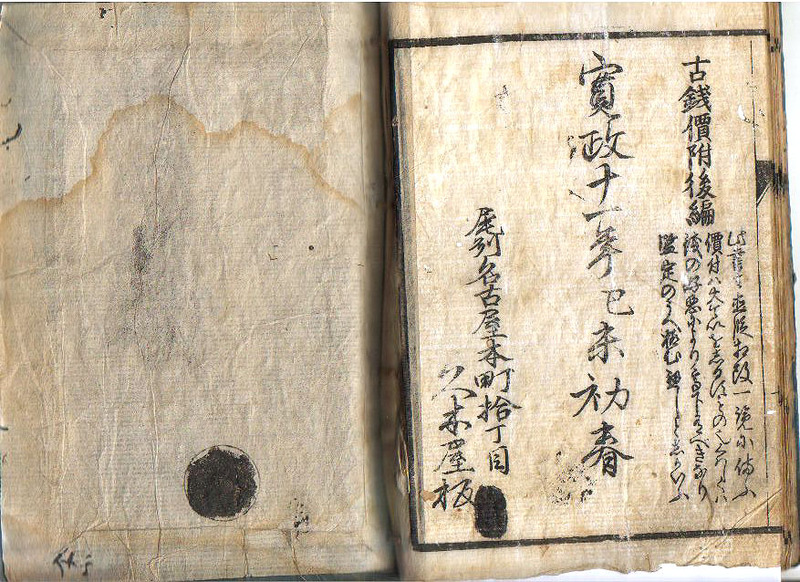 This is the eleventh and final page of Shinpan kaisei, Kosen nedantsuke, Narabi ni bantsuki (Improved New Edition: Price List of Old Coins, Together with Rarity Ranking), printed in the city of Nagoya in 1799.This book belongs to the collector Sam Leung who kindly provided me with the images and allowed me to present these at my site here. The writing inludes a final title which does not quite jive with the front page title. This one says Kosen nedan tsuke kouhen or "Price List of Old Coins, Final Volume." This is a bit troubling because this implies that the book is part of a two or three volume set, but the front page does not. The book seems to be self contained so I think the "Final Volume" may just be a mistake. The sentence on this page says. "This book has checked prices and presented them in an easy view format. The prices are general, and one can only say that the actual price of a coin will rise and fall according to knowledgeable judgement of the quality of the coin's condition." The two black spots are where an owner has inked out the seals of a previous owner. The colophon information is described at the top page.